BÉRÉNICE MAGISTRETTI for VentureBeat: Sobalvarro and his team are trying to reduce the manual labor humans shoulder in industrial work settings, leaving the heavy lifting to the robots. 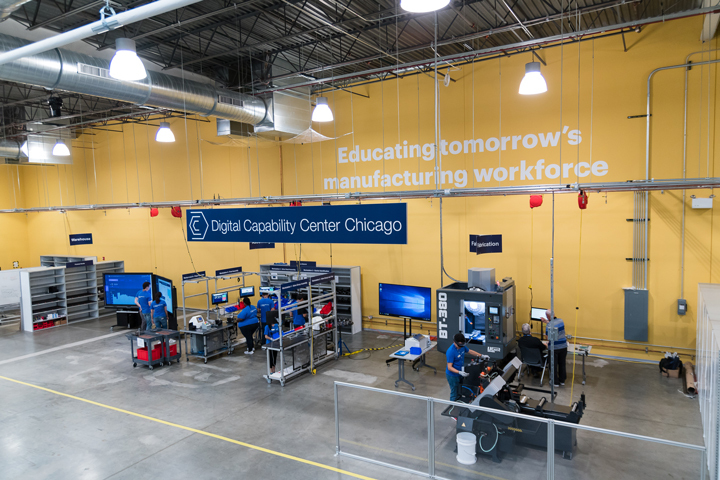 The DCC is a unique learning center where companies leaders and their workforces participate in hands-on, next-gen digital manufacturing workshops. This helps them advance their business operations, design and productivity, and prepare for tomorrows jobs. MSN: Apple chief Tim Cook announced Apple is creating a fund to get more people in the US to do "advanced manufacturing," kicking it off with a billion dollars. Desktop Metal, an emerging startup with the mission to bring metal 3D printing to all design and manufacturing teams, announced today it has raised a total of $97 million in equity funding since its founding in October 2015. The announcement comes as the result of the latest Series C investment of $45 million, led by GV (formerly Google Ventures), as well as BMW i Ventures and Lowe's Ventures. Desktop Metal will use the funding to continue to develop its technology and scale production as the company prepares for its product launch later this year. Driven by invention, Desktop Metal is committed to accelerating the adoption of metal 3D printing in design and manufacturing through the creation of innovative technology that produces complex parts. Previous investors include NEA, Kleiner Perkins Caufield & Byers, Lux Capital, GE Ventures, Saudi Aramco, and 3D printing leader Stratasys. Full Press Release.